Coloring Books And Worksheets: What's The Value Of 'Staying In The Lines'? Get ready for those coloring worksheets coming home in your child's backpack. Many kids (and grown-ups) love coloring books. But what's the educational value of staying in the lines? Crayons, of course. Scented markers. Colored pencils, presharpened. And coloring books by the jillions. Why do people like coloring so much? For grown-ups, I can totally get the nostalgia — and the simple pleasure of creating something. Do coloring books have any educational value? Do they squash creativity like a bug or, as some sites suggest, promote the development of fine motor skills? I've seen my daughter bring home worksheets from elementary school, asking her to color in this or that picture after answering a math or word problem. And, I've wondered as I watched her complete these assignments, "Isn't this busywork?" I've always thought coloring books are, educationally speaking, bad news. That "staying in the lines" isn't really the kind of independent and creative thinking we want to nurture. Am I right? So, as part of our Tools of the Trade series, here's a look at kids and coloring books and whether they have any place in the classroom. Let's start in 1947 with a guy named Viktor Lowenfeld, and some fascinating thinking about what arts education is about and what it's trying to accomplish. Lowenfeld was a professor at Penn State, and that year he published a book called Creative and Mental Growth. "He's the great-great-grandfather of art education," explains Melody Milbrandt, a professor of arts education at Georgia State University and the 2015 National Art Educator of the Year. I eventually tracked down a copy of the book. And right there on Page 176 I found a pretty good confirmation of my original impression: "There is general agreement that coloring books too are detrimental to children's creative expression." No big surprise, really. And yet, as I read that, I found myself asking: Then why is my kid bringing home these worksheets? Indeed, two pages later, Lowenfeld is astonished by this, too: "Surprisingly enough, dittoed sheets are still occasionally handed out for youngsters to color that may have outlines of George Washington, a Thanksgiving turkey, a Halloween pumpkin." Despite the fact, he adds, that "there is no evidence that these laboriously colored balloons and kites actually help to develop either number concepts or reading abilities." What surprised me the most, though, was Lowenfeld's reasoning about why coloring books are bad — at least in terms of schools and learning. Page 176: "The dependency upon someone else's outline of an object makes children much less confident in their own means of expression. 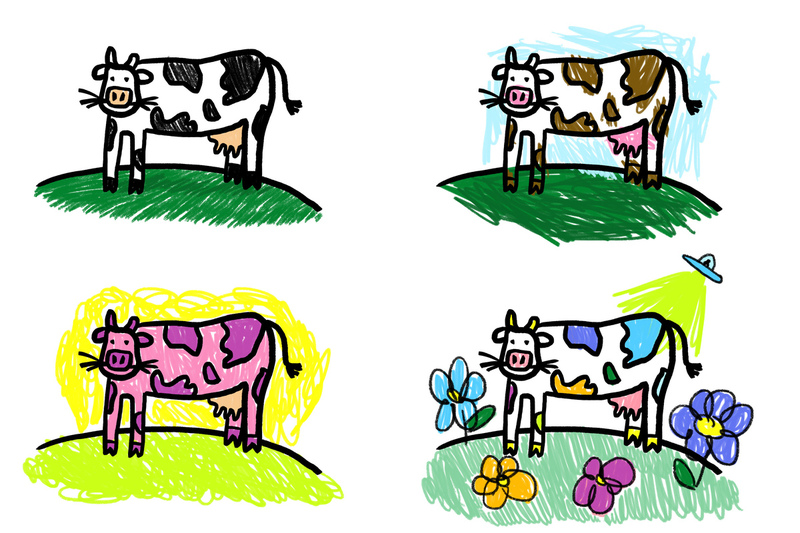 They obviously cannot draw a cow as good as the one in the coloring book." He's basically asking the question: Why color in a ready-made picture when you can create your own? Georgia State's Milbrandt explained this further: "When you look at a coloring book, you say, 'Who's making the decisions here?' The image is already there, with little opportunity for the child to construct meaning." Give kids a blank sheet of paper and ask them to draw a bird. And you'll get all kinds of fanciful images back. But give them a coloring book — where birds are drawn as two connected arcs, like a really wide and curvy "V," and then ask them again to draw a bird on their own. Many kids will start to draw birds in that very simple, "stereotyped" way. 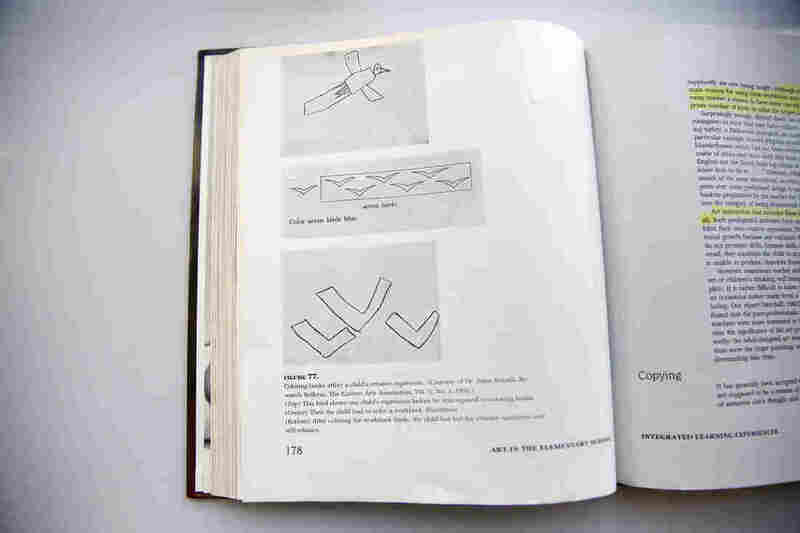 Examples of children's drawings of a bird in Viktor Lowenfeld's book Creative and Mental Growth. Milbrandt picks another example: the sun. "In our culture, the sun is up in the corner, a yellow ball with yellow rays. If [children] are seeing birds or the sun represented in a particular way, they tend to adopt those as symbols. Just like some children's literature promotes stereotypes of princesses and bad guys." And, she adds, art education isn't just about teaching kids how to draw or paint or sculpt. "Part of what we encourage children to do through art is to construct meaning and synthesize their understandings of the world. To engage at a deeper level." Or, to put it in coloring book terms: Don't stay in the lines. Create your own lines. But wait. I loved coloring when I was a kid. Isn't coloring a fun thing that parents and kids can do together? What about those fine motor skills? "If the goal is for the child to develop fine motor skills and color inside the line, they may get satisfaction by doing that correctly," Milbrandt says. But, she adds, you have to make an important distinction here: What is educational vs. what is recreational. Recreationally, she explains, "I think there is some value in coloring books — if parents are sitting and coloring, it's an opportunity to talk. But at the same time, couldn't parents be sitting and drawing with the child, or painting and creating an artwork?" That would achieve the same goals: developing motor skills, having fun, bonding ... but in a much more creative way. In economic terms, Milbrandt views coloring in terms of opportunity costs: "It's not that it's bad, but there are other things you could do that would be better." For art teachers, the message is clear: Step away from the coloring book. "We need to teach children to celebrate difference rather than celebrate conformity," Milbrandt says. "Although no one will admit it, one of the main reasons for using these workbooks may well be that they give the classroom teacher a chance to have some rest." A previous version of this story was published in July 2016.